To really appreciate the Port Campbell National Park take 86 steps down to the beach to be dwarfed by the 70m high vertical cliffline and the enormous offshore stacks. Visitors can walk in both directions along the sand. The two offshore rock stacks that may be viewed from both the viewing platform and (tide and sea permitting) from beach level are known locally as Gog and Magog and are an amazing photo opportunity. This image belongs to the travel and nature stock photo library. This stock photo of Gog and Magog at Sunrise is available for licensing for commercial and editorial uses including websites, blogs, books, magazines, brochures and advertising. Restrictions may apply for images which contain third party copyrighted material or sensitive subjects. Photos of artwork are for editorial use only. 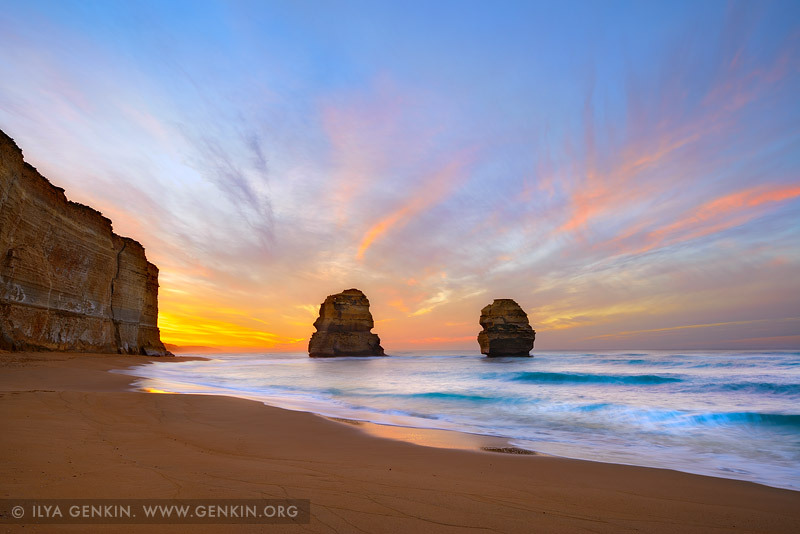 This image id APOST-0032 of Gog and Magog at Sunrise, is copyrighted © by Ilya Genkin. This is not a public domain image.